Harry Bosch is coming back in a big way. Amazon has renewed its Bosch TV show for a fifth season. In addition to the season five renewal, they’ve also announced, Bosch, season four, debuts on Amazon on Friday, April 13, 2018. Check out the new key art poster (above) and the official trailer, below. The series is free to stream for Amazon Prime members. Purchase an Amazon Prime subscription, here (affiliate link). 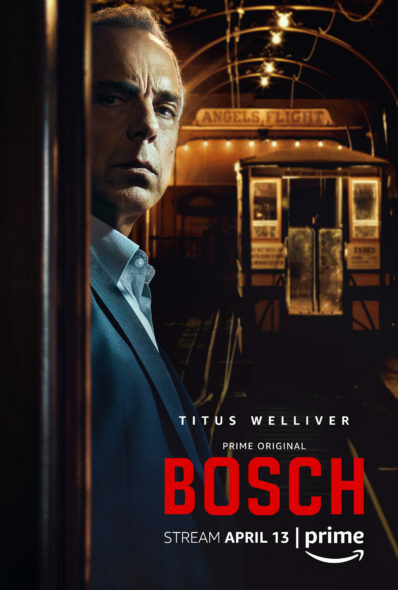 Based on the Michael Connelly book series, Bosch stars Titus Welliver as dogged Detective Hieronymus ‘Harry’ Bosch, of the LAPD’s Hollywood Homicide Division. The Amazon cast also includes Jamie Hector, Amy Aquino, Madison Lintz, and Lance Reddick. The 10-episode fourth season is based on the novel, Angels Flight. Watch the new Bosch trailer for the fourth season. Check out the Amazon press release on Bosch. SEATTLE—Feb. 13, 2018—(NASDAQ: AMZN)—Amazon today announced it has greenlit a fifth season of the longest-running one-hour Prime Original Bosch. Executive Producers Eric Overmyer and Daniel Pyne are slated to team up as co-showrunners. Season four of the Emmy-nominated series will premiere exclusively on Amazon Prime Video on Friday, April 13. Bosch is produced by Fabrik Entertainment, a Red Arrow Studios company. Based on Michael Connelly’s best-selling novels, the hour-long series Bosch stars Titus Welliver (Lost) as homicide Detective Harry Bosch, Jamie Hector (The Wire) as Jerry Edgar, Amy Aquino (Being Human) as Lt. Grace Billets, Madison Lintz (The Walking Dead) as Maddie Bosch and Lance Reddick (The Wire) as Deputy Chief Irvin Irving. In the ten-episode season four, when an attorney is murdered on the eve of his civil rights trial against the LAPD, Bosch is assigned to lead a task force to solve the crime before the city erupts in a riot. Bosch must pursue every lead, even if it turns the spotlight back on his own department. One murder intertwines with another, and Bosch must reconcile his past to find a justice that has long eluded him. Bosch was developed for television by Overmyer (Treme, The Wire, Homicide: Life on the Streets) and is executive produced by Pyne (Backstabbing For Beginners, Fracture, The Manchurian Candidate), Overmyer, Bastin (The 100 Code, American Odyssey, The Comedians), Pieter Jan Brugge (Heat, The Insider, The Clearing), John Mankiewicz, Connelly, Pabst, Jan David Frouman and Elle Johnson. Welliver also serves as Producer. Prime members can stream seasons one, two and three of Bosch exclusively via the Prime Video app for TVs, connected devices including Fire TV, mobile devices and online at www.amazon.com/boschtv. Members can also download the series to mobile devices for offline viewing at no additional cost to their membership. The series is a global release and available on PrimeVideo.com for Prime Video members in more than 200 countries and territories. Check out all of our Bosch TV show news. What do you think? Are you a fan of the Bosch TV series? Do you plan to check out seasons four and five on Amazon? Let us know, below. I love the Bosch series! Please bring it back for Season 5 and more. We absolutely love the Bosch series! One of the best shows on tv, by far. Please don’t be one of “those” other networks that cancel popular shows. Keep giving us quality tv!! Thank you! Just finished season 4, Amazon please keep them coming! Best crime series on television. Great acting, great script, so realistic in portraying the life of a homicide detective in LA. Love this show! We like the show very much appreciate actors that can take you along with them as Titus is capable of doing. Perhaps a less use of the F word as it really doesn’t add anything to the acting ability of most of the cast. Love the show. Looking forward to season five. Bosch… is one of the best shows I’ve seen in years. I love everything from the cast to the theme music. What my wife and I really love is how the show portrays real human emotions, what real people would do and will do in certain situations in life, the ups and downs. Kudos keep them coming. The best show to date, please keep up the renewals and I’ll keep watching. Great cast and the best writing. This show is awesome! Best TV I have watched in a long time….keep this series going! This show has great actors, great plots, great entertainment that feels so true to life and it keeps me on the end of my seat. Greatest detective show ever….Titus kills it. Just finished season 4…hope it continues!! I like the premise of the show, the cast, the writing, and the attitude toward the audience of “keep ’em guessing.” (I watch so many crime shows I can frequently figure out the whole plot. Even the true ones.) Also the show’s location scouts are doing a super job of finding places to shoot. Then, these beautiful outdoor and indoor locations are woven throughout the show in a way that is natural and not “staged.” I have only been to LA once and I loved it. It’s a huge, amazing, crazy, wonderful, overwhelming, fabulous, intimidating, and dangerous place. Go, Amazon! Agree with the others -this is one of the best TV drama series I have seen. Please, please continue the great work! Best TV crime drama by a long shot. Looking forward for many seasons to come. Thank you for such a great series. Michael Connelly has written great stories about Harry Bosch , and Amazon has made them jump off the pages. Looking forward to season 5. Bosch is my favourite Amazon series. Ready for the new season. Keep the episodes coming please.